The Colosseum, or the Coliseum, originally the Flavian Amphitheatre (Latin: Amphitheatrum Flavium, Italian Anfiteatro Flavio or Colosseo), is an ancient elliptical amphitheatre in the centre of the city of Rome, Italy, the largest ever built in the Roman Empire. It is considered one of the greatest works of Roman architecture and Roman engineering. Occupying a site just east of the Roman Forum, its construction started in 72 AD under the emperor Vespasian and was completed in 80 AD under Titus, with further modifications being made during Domitian’s reign (8196). The name “Amphitheatrum Flavium” derives from both Vespasian’s and Titus’s family name (Flavius, from the gens Flavia). Capable of seating 50,000 spectators, the Colosseum was used for gladiatorial contests and public spectacles such as mock sea battles, animal hunts, executions, re-enactments of famous battles, and dramas based on Classical mythology. The ancient building ceased to be used for entertainment in the early medieval era. It was later reused for such purposes as housing, workshops, quarters for a religious order, a fortress, a quarry, and a Christian shrine. Although in the 21st century it stays partially ruined because of damage caused by devastating earthquakes and stone-robbers, the Colosseum is an iconic symbol of Imperial Rome. It is one of Rome’s most popular tourist attractions and still has close connections with the Roman Catholic Church, as each Good Friday the Pope leads a torch-lit “Way of the Cross” procession that starts in the area around the Colosseum. The ancient Pantheon was originally built in 27 BC by Marcus Agrippa, Caesar Augustus’ son in law. 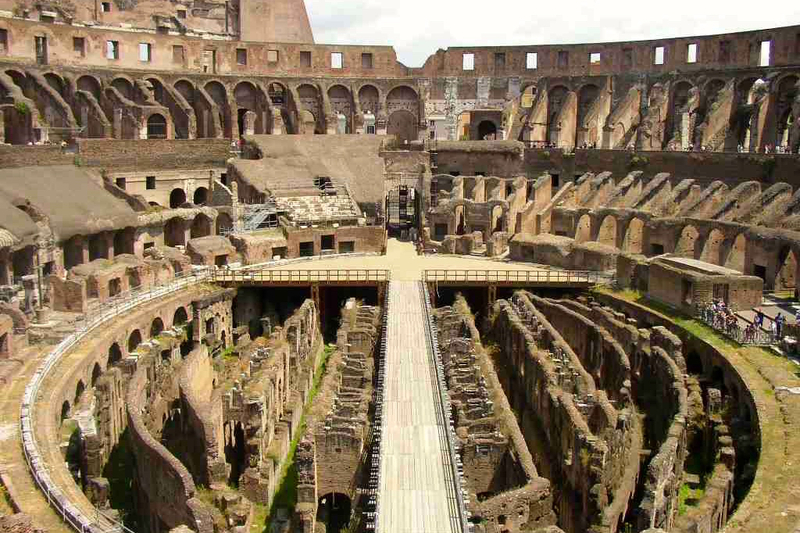 It was destroyed by fire in 80 AD and was rebuilt by Domitian, the eleventh Roman Emperor. However, the Pantheon was burned down again in 110 AD after being struck by lightning. The existing Pantheon was built by Emperor Hadrian in 126 AD and was the largest concrete structure in the world until the 20th century. The building has a 43.3m (142ft) dome which stood as the largest in the world until 1436 when the Florence Cathedral was constructed. 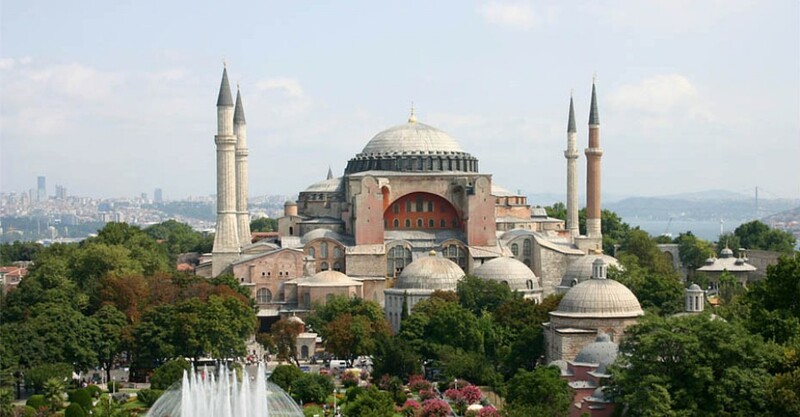 Built in 532-537 on the orders of the Byzantine Emperor Justinian. Hagia Sophia or Ayasofya as it is known in Turkish was the largest cathedral in the world for nearly a thousand years, until the completion of the Seville Cathedral in 1520. Hagia Sophia was initially built as a church, it was also built after the example of Pantheon in Rome, however in 1453 Hagia Sophia was converted to a mosque. The Great Pyramid of Giza (called the Pyramid of Khufu and the Pyramid of Cheops) is the oldest and largest of the three pyramids in the Giza Necropolis bordering what is now El Giza, Egypt. It is the oldest of the Seven Wonders of the Ancient World, and the only one to remain largely intact. 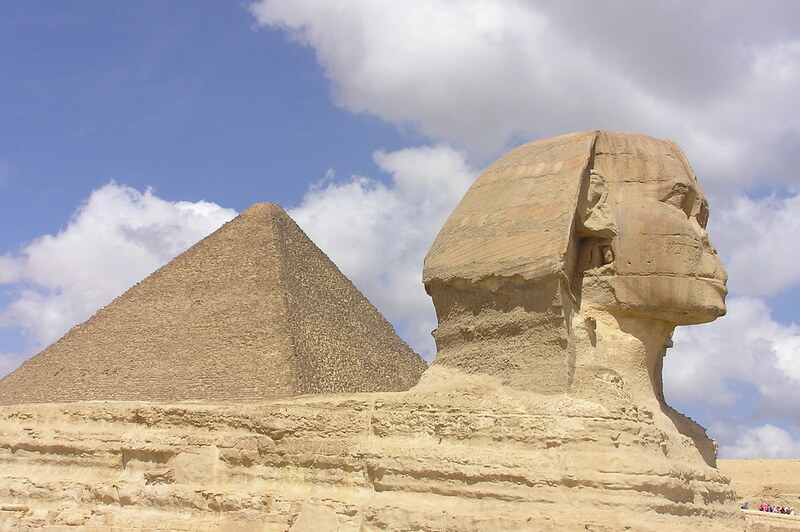 Egyptologists believe that the pyramid was built as a tomb for fourth dynasty Egyptian Pharaoh Khufu (Cheops in Greek) over an approximately 20 year period concluding around 2560 BC. Initially at 146.5 metres (480.6 ft), the Great Pyramid was the tallest man-made structure in the world for over 3,800 years. Originally, the Great Pyramid was covered by casing stones that formed a smooth outer surface; what is seen today is the underlying core structure. Some of the casing stones that once covered the structure can still be seen around the base. There have been varying scientific and alternative theories about the Great Pyramid’s construction techniques. Most accepted construction hypotheses are based on the idea that it was built by moving huge stones from a quarry and dragging and lifting them into place. The most famous of all Irish prehistoric monuments and also one of the most famous ancient monuments in the world. Newgrange was built between c. 3100 and 2900 BC, more than 500 years before the Great Pyramid of Giza in Egypt. It is also 1000 years older than Stonehenge. The mound structure covers an area of one acre. 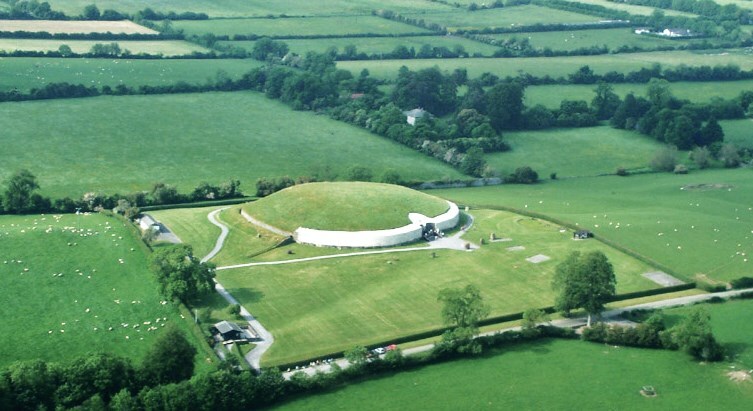 Newgrange is currently one of the most visited monuments in Ireland, with over 200,000 visitors each year. 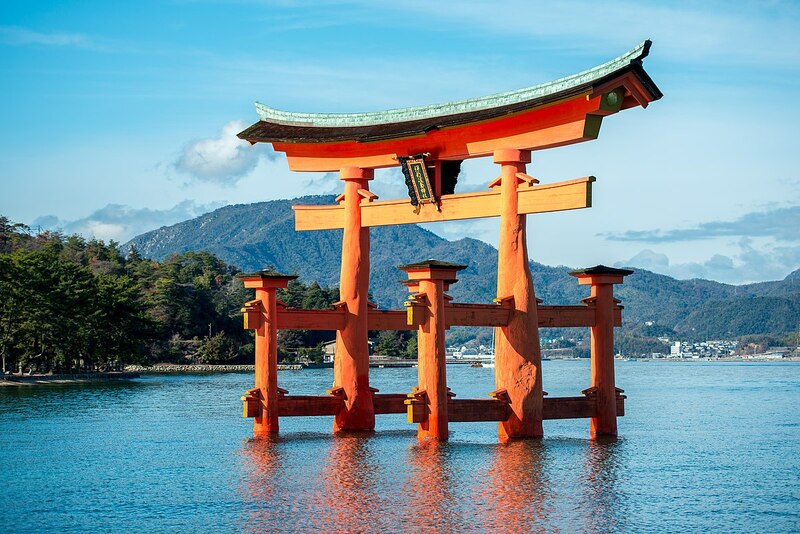 Itsukushima Shrine is one of the most scenic places in Japan, the attraction is famous for the Torii Gate. The Torii Gate is an orange entrance to the shrine which is built on water. When the tide is high, the gate looks as if it’s floating on water. Thus the name, ‘floating Torii’. The shrine dates back to the end of the 6th century, but has been destroyed several times in its history. The current shrine was constructed around 1168. The Great Sphinx of Giza (Arabic: abu alhōl / ʼabu alhawl, English: The Terrifying One), commonly referred to as the Sphinx, is a limestone statue of a reclining or couchant sphinx (a mythical creature with a lion’s body and a human head) that stands on the Giza Plateau on the west bank of the Nile in Giza, Egypt. It is the largest monolith statue in the world, standing 73.5 metres (241 ft) long, 6 metres (20 ft) wide, and 20.22 m (66.34 ft) high. It is the oldest known monumental sculpture, and is commonly believed to have been built by ancient Egyptians of the Old Kingdom during the reign of the pharaoh Khafra (c. 2558 2532 BC). The Great Sphinx is one of the world’s largest and oldest statues, but basic facts about it, such as who its face was modelled after, when it was built, and by whom, are still debated. These questions have resulted in the popular idea of the “Riddle of the Sphinx,” although this phrase should not be confused with the original Greek legend of the Riddle of the Sphinx. Pliny The Elder mentioned the Great Sphinx in his book, Natural History, commenting that the Egyptians looked upon the statue as a “divinity” that has been passed over in silence and “that King Harmais was buried in it”. This was built the the emperor Domitian from 81 AD to 85 AD. Domitian built this as a dedication to his older brother Titus who died on September 81 AD, Titus had captured Jerusalem during The Great Revolt( also known as The Jewish War). 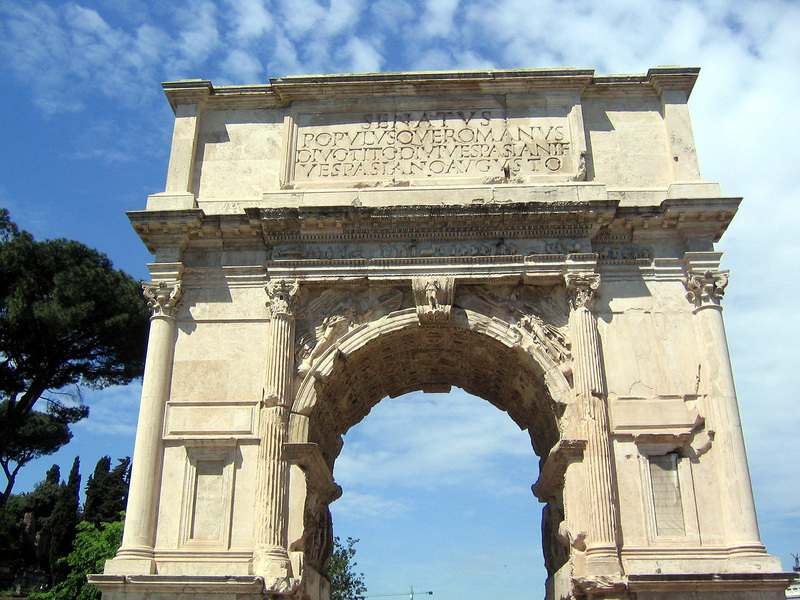 Arch of Titus is situated at the highest point of the Via Sacra, it is also the oldest surviving arch in Rome. 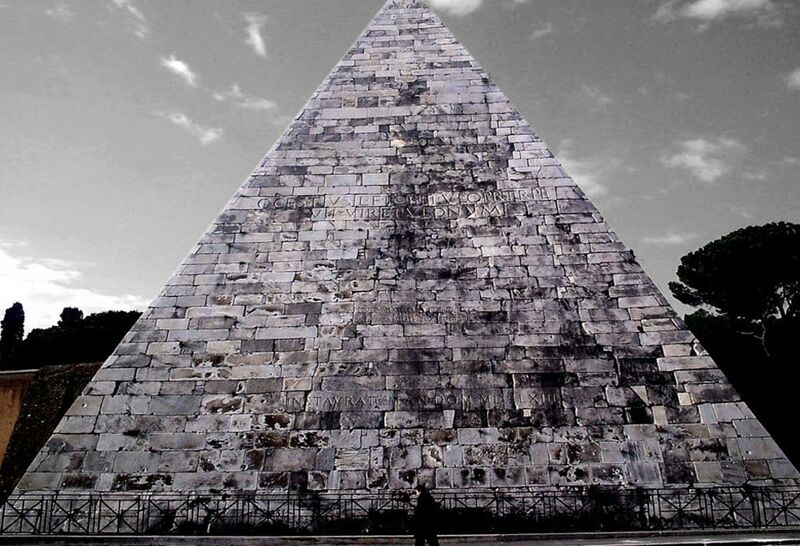 The ancient Pyramid of Cestius was probably built between 18-12 BC. It was built as a tomb for Gaius Cestius Epulo who had been an elected magistrate and a member of a committee which was responsible for sacred banquets. The Pyramid of Cestius was constructed during the period of Roman rule in Egypt and the Roman architecture was undergoing ‘Cleopatra craze’, where everything Egyptian became popular. The 36m (120 ft.) high pyramid was built in a period of 330 days, according to the carved inscriptions. Commonly referred to as Kaiserdom (‘Imperial Cathedral’), Aachen Cathedral is the oldest cathedral in northern Europe dating back to the year 805 AD. 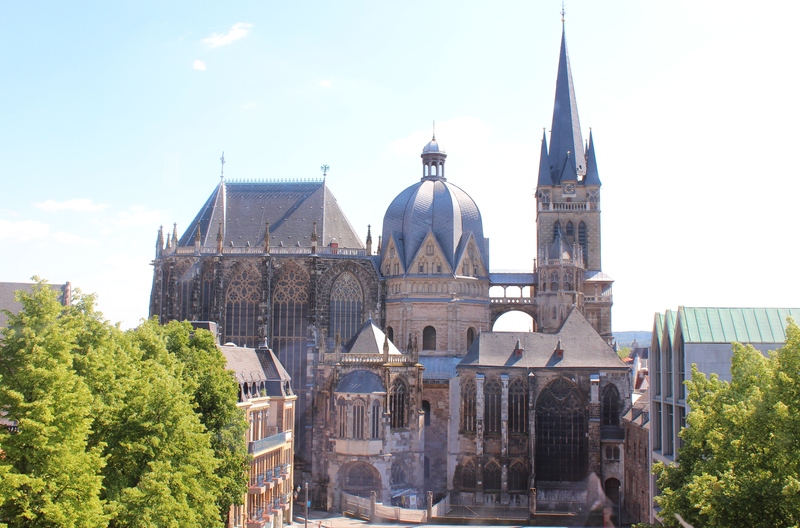 It was also known as the Royal Church of St. Mary at Aachen during the middle ages. The cathedral was built as a palace for Emperor Charlemagne between 786 and 805. The Emperor was buried here when he died in 1814. The remains were opened in 1165 by Emperor Barbarossa and placed in a sculptured sarcophagus made of parian marble. The bones of Charlemagne were moved again in 1215 by Frederick II and were put in a casket of gold. In 1978, the Aachen Cathedral made an entry to the UNESCO list of heritage sites.